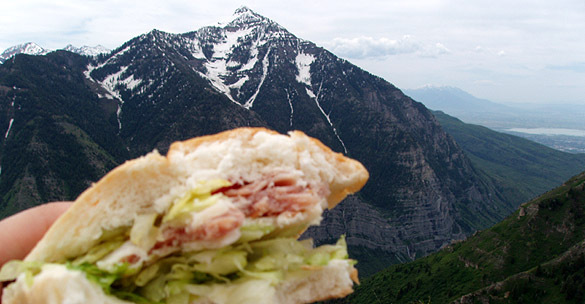 Ham and Swiss Atop a Mountain! | Delicious! Delicious! Ham and Swiss Atop a Mountain! Caryn is half asleep standing by the counter. A young, SNOWBOARDER-TYPE GUY meticulously prepares Caryn’s sandwich while she waits. He hands it to her with a smile and she shoves it in her backpack that’s already heavy with a couple liters of water. Caryn hikes up a rocky incline in the morning sun. Her backpack is strapped to her over the light jacket that serves as the only protection from the surprisingly chilly wind. She is only a few feet from the top, but she is exhausted from the up-hill climb to the summit. The clouds are rolling in at a rapid pace, threatening to block Caryn’s view of the spectacular peaks that surround her. She races to beat them and she wins. Caryn has climbed to the top of one of the highest peaks at the tranquil Sundance resort. Bare ski trails fall off at an alarmingly steep grade beneath her. One deep breath of the crisp, fresh air and her color returns with a vengeance. She plops down and digs in her backpack for her sandwich. She unwraps the ham and swiss, on bread that’s still soft. She’s earned a good bite to eat. But one bite into it and her cell phone perks up. She pulls it from the bottom of the backpack. I can’t find the butter. Her hand slumps to her lap with the sandwich still in it. On the door of the frig. On the door, in a yellow box. There must be two pounds of butter there. Nevermind, I changed my mind. Caryn falls on her back and covers her face with her arm. Are you coming back soon? She takes in one last breath of that delicious air. Yes. I’m on my way. You could eat anything atop a mountain and it will taste good! Gandolfo’s may not be the most authentic New York deli you can find in Utah, but they make a nice sandwich for a backback. And they’re open in the morning when you need to get an early start on your outdoor adventure. Many locations in Utah to serve you. lol That reminds me of my officemate, whose husband typically calls her with ‘emergency’ questions like “Where are the hot dog buns?”. Boy, are they going to get together? Ack, the suspense! Let ‘em find his own damned butter! Meticulously sorts seeds and stems, maybe! My, my, isn’t he a bit bratty? I’m assuming it’s not a gargantuan fridge – two pounds of butter shouldn’t be impossible to find! Poor Caryn, one bite and only one breath of peace! But, that is a very tasty looking sandwich! Anyway, judging from your blog entries you come to Utah once in a while so there are some places I would recommend. It would be fun to read the blog some day and see one of your fantastic photos of one of my favorite dishes. It’s beautiful! The mountains not bad either. Thanks for the tips, Kalyn. Wish I had them when I was there! I guess I’m gonna have to make another trip…maybe this time during ski season.